This weekend’s cookie was an old favorite with a twist! I made a light and sandy chocolate chip peanut butter cookie and filled it with chocolate hazelnut spread and peanut butter. You get a little of everything in one small cookie. Or one large cookie. I couldn’t decide whether I liked the larger version or the mini version better, so go with what you feel like. Making the cookies small is more time consuming, but you’ll be able to feed a larger crowd. 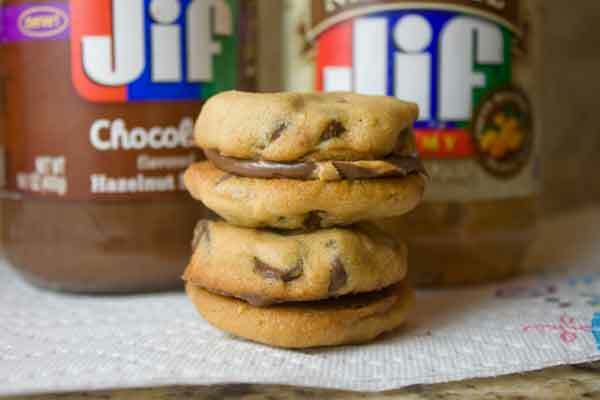 If you’d prefer daintier, less sweet cookies, skip the sandwiching altogether and just serve these as chocolate peanut butter chocolate chip cookies. 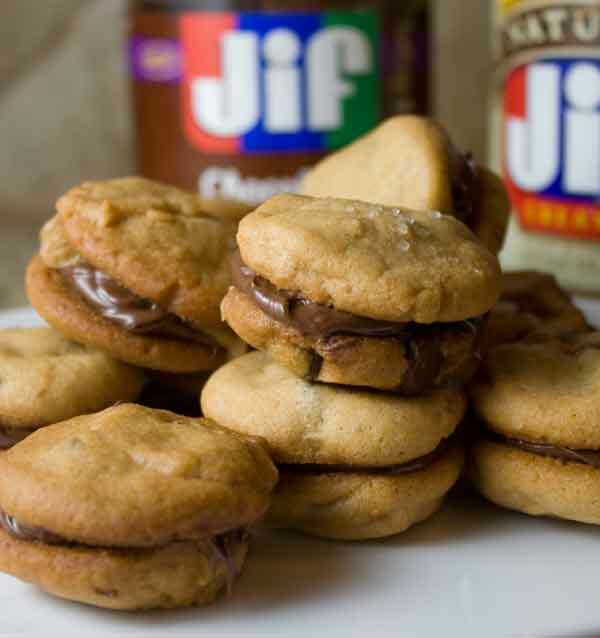 Peanut butter chocolate chip cookies sandwiched together with chocolate hazelnut spread and peanut butter. Preheat oven to 350 degrees F. Line two cookie sheets with nonstick foil or parchment paper. In a large mixing bowl, beat the butter and brown sugar until creamy. Beat in the peanut butter, salt and vanilla, scraping sides and beating until smooth. Beat in the egg, beating just until it is mixed. Stir in the baking soda until it is thoroughly blended, then stir in the flour. When flour is blended, stir in the chocolate chips. Using a level teaspoon of dough, scoop up dough and shape into balls. For larger cookies, use a level tablespoon. Press the balls into circles and arrange about 2 inches apart on the cookie sheets. If desired, sprinkle half the dough rounds with sparkling sugar. I like the look of the cookie. I’m still annoyed that I can’t get the new Jif spreads here, or at least not places I’ve been/looked. Yum! Fun idea, not sure why I haven’t thought of that before. That’s what good baking blogs are for.